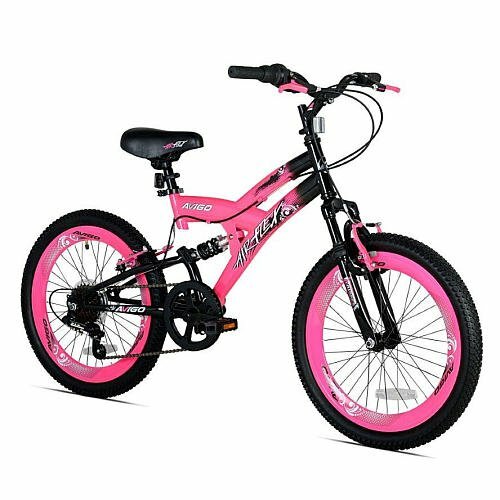 She'll look so cool riding around on this awesome Black and Pink 20 Inch Girls Avigo Air Flex Dual Suspension bike. The twist grip shifting makes it easy for them to change speeds on the go, and the downhill suspension will help keep their ride nice and smooth. Designed for kids ages 7 to 10 with an inseam of 22 to 25 inches. Place your order today and get ready to hit the streets. If you have any questions about this product by Avigo Air, contact us by completing and submitting the form below. If you are looking for a specif part number, please include it with your message.